Looking for people to join! We want to convey the taste of Hachimantai more realistically. "Hachimantai Auberge" tour was born from such a thought. 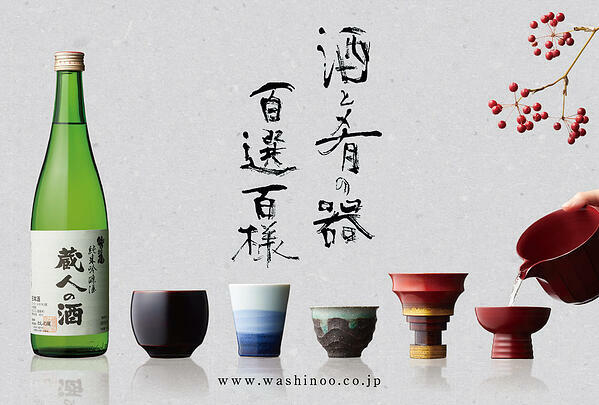 As the First time will present the theme of Hachimantai's local Japanese wine "Washinoo." The tour starts from the opening event of the Washinoo, "Hundreds of Selections of Liquor and Relishes." We are exhibiting a sake machine by a crafter artist of Iwate and proposing a moment to taste the sake of Washinoo carefully. After visiting sake brewery, we will visit a local Washinoo store and enjoy a traditional lunch box using Hachimantai's ingredients with an excellent Washinoo Tasting where we are going to compare and guess the type and enjoy the differences of the taste. 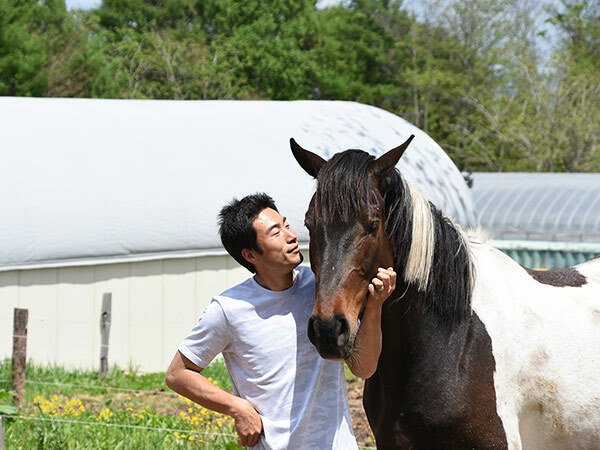 Geo-farm HACHIMANTAI is a farm that produces Hachimantai mushrooms utilizing equestrian compost fertilizer and geothermal power. Here is an unexpected relationship to practice circulating agriculture with Washinoo. the eighth generation Washinoo owner. As the final process to decide the taste of sake, there is "Tamawari" which means to add water to adjust its alcoholic percentage. The water in Washinoo comes from the underground water of the beautiful scenery of Mt. Iwate. Let's do Tamawari and experience the taste of the water use in Washinoo as well as enjoy how the flavor changed according to the degree of alcohol when you added it to the sake. Let's enjoy Washinoo and Hachimantai food “Mariage” with Washinoo's owner. For dinner, we have a full course using Hachimantai fresh local ingredients. Please listen to the explanation of each sake and how it fits each dish, giving by the owner of Washinoo while enjoying the sake and food mariage. 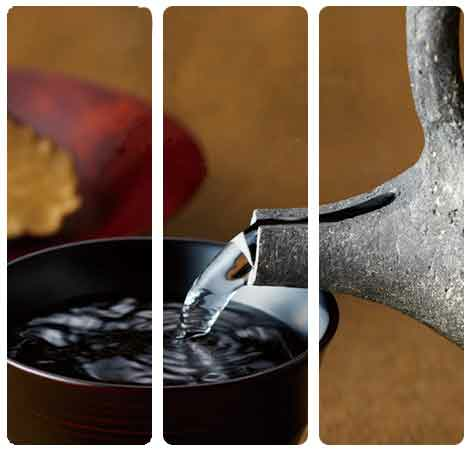 We offer a carefully selected collection of sake such as Hachimantai limited sake and aged sake. Also, the drinking vessel use is the work of a craft artist from Iwate prefecture, which also participates in "Hundreds of Selections of Liquor and Relishes." Depending on the drinking vessel it changes the way of enjoying Japanese sake in various ways, such as how to smell, when you hold it in your hand when you touch it with your mouth. 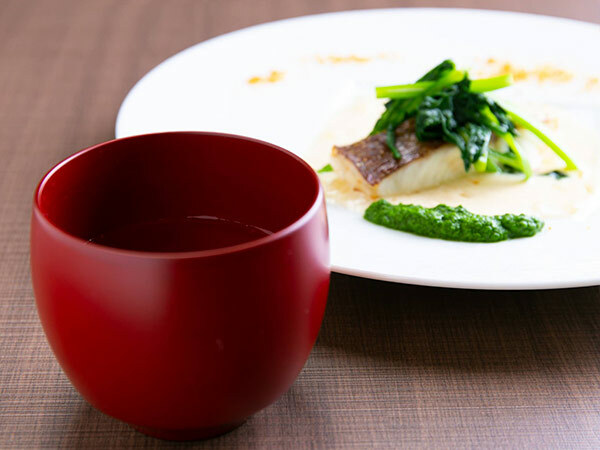 It is a commitment event for everyone who loves sake where you can enjoy the compatibility in between the sake and the vessels, such as ceramics, porcelain, lacquerware, etc. 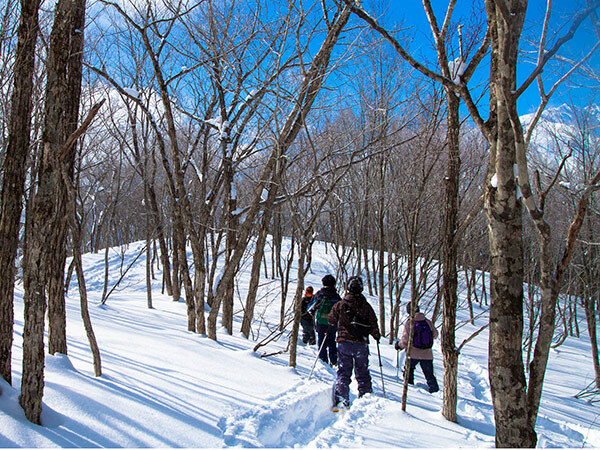 The next day of your stay, you can enjoy skiing at Hachimantai, and/or taking a snowshoe tour from the hotel. After the event "Hundreds of Selections of Liquor and Relishes." and the Warehouse Tour, let's enjoy some delicious handmade soba and Washinoo's special Amazake (a traditional sweet non-alcoholic Japanese drink made from fermented rice). Located with a beautiful sight, before used as the stage for JR East CM "Let's go, Tohoku" story, with the majestic view of Mt Iwate and Geo-Farm Hachimantai 's horses. Here will have an introduction of Geo-Farm Hachimantai and their strong relation with Washinoo company by practicing circulating agriculture. One of the One Hundred Japan Water elected, for its pure, drinkable and good maintenance status. The amount of water that springs gently in the snowy landscape is a masterpiece. Adjacent Iwate Prefecture Aquaculture Fisheries Cooperative Association, you can easily purchase trout grown in this Kanazawa Shimizu. The water in Washinoo comes from the underground water of the beautiful scenery of Mt. Iwate. Let's do “Tamawari” and experience the taste of the water use in Washinoo as well as enjoy how the flavor changed according to the degree of alcohol when you added it to the sake making it unique and right for yourself. 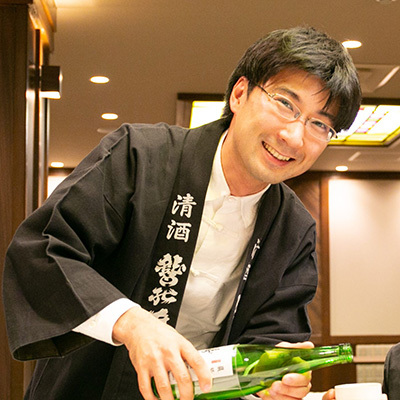 Here we will enjoy a full course dinner using Hachimantai abundant fresh local ingredients followed by the explanation of Washinoo's owner about Japanese sake and food pairing. 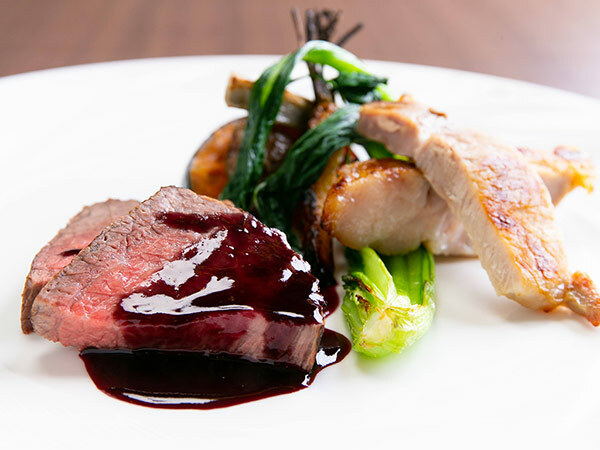 Please enjoy the hotel buffet which is rich with fresh local ingredients from Hachimantai Iwate. Pick up by bus, from the hotel to Morioka Station West Exit Bus Rotary. Guests who do not participate in the optional tour are welcome to take this bus. Participation fee 4,000 yen per person. * Please apply for it when making the reservation for the bus tour. On the way back to Morioka station you may use a regular bus line. Planning and Implementation: Northern Iwate Travel Service Inc. Founded in 1829. It is also called "Ganjusan" that means rock, eagle and mountain, because it seems like an eagle in the spring snow shape in the beautiful scenery of Mt. Iwate, which is representative of Iwate. "Washinoo" which brews with pure water that springs off from the foot of this mountain is the inscription of Hachimantai which continues to brew in this place for about 200 years. In addition to winning the gold medal at “The National Bureau’s Research Institute of Brewing” and winning the platinum prize at sake brewery "KURA MASTER Le grand des sakes japonais de Paris 2017" and "KURA MASTER Le grand des sakes japonais de Paris 2018" held in France, certifies a certain quality domestically and internationally accepted.